If you’ve been looking for a new boiler, there’s a good chance you’ve already come across BOXT. They’re a new UK company hitting TV, YouTube and Google Ads hard, to drum up a customer base. And, it seems to be working. They now install more units that Homeserve, e.ON and the AA combined. BOXT boilers can be installed as soon as next day. And, they provide coverage on a nationwide basis; everyone’s covered. Below we’re going to cover everything you need to know, before you get your new boiler installed. And by everything we mean online reviews, who owns the company, and how their prices fair against the likes of British Gas. Their website was started by the former owners of Help-Link, a large UK boiler servicing, repair and installation company. They had an idea to change the way we get online boiler quotes and came up with BOXT. But, there’s a twist. Bosch (who own Worcester Bosch, one of the leading manufacturers of boilers), own a 45% stake. So, if you’re wondering why all BOXT boiler quotes feature Worcester Bosch, that kind of answers that question. Worcester Bosch are supplying the BOXT installers with boilers at a highly competitive price. Essentially, you’re getting a higher quality boiler for a lower price than you would be otherwise. There are plenty of reviews around the net. The ones offering the most validity, are over at Trustpilot. BOXT has been topping Trustpilot reviews for months now. Their review count is over 1,000 with 5 stars, thanks to a 99% review rating. That’s given them the #1 spot for both gas installations and central heating installations on Trustpilot. You can see all BOXT reviews on Trustpilot here. What Types Of Boiler Do BOXT Install? When BOXT was originally launched, they focused only on gas boiler replacement. Most UK properties are connected to mains gas. So, it made sense that they’d start (and perfect) their online buying process for gas boilers first, then move onto other fuel types. Currently though, if you don’t have a gas boiler it’s unlikely you’ll get an online quote. To confirm the details, you’ll need to speak to a heating advisor at BOXT. If there’s one complaint that consumers have, that’s the one – it’s not necessarily a purely online service, UNLESS you have a gas boiler. One of the things consumers have been happy about, is BOXT boiler prices. Part of the reason the prices on offer here are low, is obviously due to their direct connection to a boiler manufacturer; Worcester Bosch. 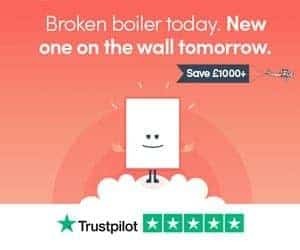 However, there’s another piece of the puzzle that allows consumers to save money on the price of their boiler replacement; the quote process itself. Quotes take time. Imagine you’re a boiler installer. You might do 10 quotes in a week, so 2 every night. By the time you’ve travelled to the address of each quote, assessed the property, phoned a merchant to get costs for the boiler and other parts, that’s a lot of time; it’s like a part-time job. And, then there’s the fact, that you won’t be awarded each job you go and quote. Some people change their mind, go elsewhere for whatever reason, or just find something cheaper. Time, commitment and money (fuel etc), for jobs that aren’t guaranteed. By removing the need for an on-site visit, BOXT cuts a HUGE cost that the average boiler installation company has to account for. And, that cost is slashed from your installation quote. You’ll click through a multiple-choice form, which asks for information regarding the type of boiler you have, the number of showers, the size of your property, and so on. Essentially, this determines the type of Worcester boiler that’s suited to your property, as well as hot water and heating demand. Some of these questions relate to additional parts installers need to purchase for the job. More importantly, they’re ensuring that your current boiler setup is Gas Safe. If it’s not, they’ll need to make sure that that’s the case before the job is finished. So, once you’ve fired all your details into the online quote form, how much should you expect to pay? There are so many variables, it can vary. If you’re in a small property (say, 1-2 bedrooms), it could be around £1,900. If you’re in a huge property, and there’s lots of additional work to be done aside from just swapping the boiler, this cost could spiral to £2,500 and beyond. That’s why their online quotation tool is useful. You can get an online quote without putting in any contact details or committing to a site visit/purchase. You can get a boiler replacement quote from BOXT right now using their online tool, check it out here. Are BOXT Boiler Installations Cheap? According to BOXT, they average 1/3rd cheaper than many boiler installation companies, including British Gas. That’s a lot of extra pound notes to rub together. In the example above, a straight boiler swap, for a Worcester 25I, is a good deal. There are not many installers that will quote that low AND be able to offer the full 10-year warranty from Worcester (see below). However, if you want a compact boiler, the 25I and equivalent larger output boilers, are not where you should be looking. You’ll need to get something like the CDI Compact, or SI. The 25I suits the smaller properties, with the 25SI being the compact equivalent, for those short on space. And, if you’ve got a slightly larger property (3 bedroom semi, say) or high hot water demand, you’ll be looking at something like the 30I. Considering the quality of the boiler on offer and the warranty, we thought the 3 most suitable quotes were competitively priced. What’s Included With A BOXT Boiler Replacement? This removes debris from your radiators, towel rails and pipework. That’s going to ensure that none of this junk finds its way into your boiler, causing it to break! There’s a good chance that if your boiler’s failed, central heating sludge is to blame. That’s a mixture of iron oxide (rust) and dirty heating water. By using inhibitor to flush out the system, most sludge can be removed. You’ll also get a smart thermostat, worth up to £199.99. Now, they don’t mention which smart thermostat you’ll be getting here, but at that price, it should be one at the higher end, like HoneyWell, Nest or Tado. Generally, you’ll get around 2%+ efficiency from installing a thermostat like this, and it certainly looks better than a cheap wired thermostat. Now, this is REALLY important. Most boiler replacement quotes that look cheap, are cheap for a reason. They re-use old controls, don’t flush out your system, and leave your boiler unprotected. Even if they do flush out your system, it needs to be dosed with inhibitor, and a magnetic boiler filter fitted, just as you’ll get with a new boiler from BOXT. Warranties from Worcester Bosch start at 5-years. You can only get 10-years, from those with Worcester Bosch accreditation. And, it looks like all BOXT installers have it, given their warranty offering on the 25I mentioned above, is 10-years. Here’s the thing about getting a new boiler from BOXT; you don’t have to pay for your boiler upfront. We already know that replacing a boiler can lead to cost savings of up to £25.41 per month. And with BOXT, your new boiler could pay for itself. How? Boiler finance plans here start from £11.61 per month. Combine both energy savings, and savings when it comes to the cost of repairing your boiler (or not, given there’s a 10-year warranty); there’s a good chance that’s going to cover the monthly repayment. Who Should Buy A Boiler From BOXT? There’s a good chance you’ll start seeing more and more boiler websites like BOXT appearing. The fact is, most boiler quotes don’t need to be site visits. By removing the move for a site visit (and having a good connection with Worcester Bosch), they’re able to offer boilers at a reasonable price, saving everyone time and money. To see what BOXT would quote you for a new boiler, visit their quotation tool here. Thanks for reading our buyer’s guide to buying a new boiler from BOXT. Got questions about anything BOXT? Had a boiler installation quote from elsewhere, and don’t know what to do?